There’s nothing more Central Oregon than pitching a tent next to a high alpine lake, setting up a campfire and enjoying the peace and quiet of a night under the stars in the wilderness. Luckily, we have more than a million acres of National Forest for you to explore so you’re bound to find your own secluded spot to be one with nature. And you can do that right in the middle of town, if you like, at Bend’s Tumalo State Park. But perhaps a scenic, fully-equipped RV park with landscaped pads, fire pits, laundry, WiFi and big rig friendly access is more your style. We have plenty of options there as well. Looking to “rough it” with a little more style? Check out the rustic cabins at Elk Lake Resort (with a full-service lodge just down the trail.) We’ve taken “glamping” to new levels with safari tents at Panacea at the Canyon or the teepees at Kah-Nee-Ta Resort on the Warm Springs Indian Reservation. Want to talk to some locals for the inside scoop on the best campsites? Give us a call and we’ll reveal some of our favorite spots. 1-800-800-8334. Rustic or semi-refined, we’ll help you find the perfect place to put up your feet. Under New Ownership! Newberry RV Park – Not far from Crater Lake, Bend, Sunriver, Sisters, and Mt. Bachelor, you’ll find one of the most beautiful camping areas in Oregon. If you are leaving Bend or heading to Bend, Oregon the Newberry RV Park is a great place to stop for a few days to check out the recreation in the south Deschutes County. You can check out the Paulina Lake area or East Lake and the entire Newberry National Monument area. A 30 minute drive east of the park, the Newberry National Monument is waiting for you to explore its ancient lave flows, volcanic glass, river, lakes, caves, hot springs, waterfall and forest. A must not miss is a drive up to Paulina Peak to take in the 360 degree views of central Oregon. Nearby you can explore Sunriver Resort where you can rent bikes and ride the 33 miles of paved trails in Sunriver. Also in the Sunriver Village you will find iceskating in the winter and in summer play miniature golf, bumper cars and rent bikes. Also you can rent skis, snowboards, bikes for your recreation needs. In addition, the shops at the Sunriver Village offer souvenirs and specialty items. Newberry RV Park offers terrific camping activities nearby, including fishing, boating, hiking, caving, and much more. All sites include 30 and 50 AMP service at each site, water/sewer, Wi-Fi, showers, restrooms, laundry, cable TV and coin laundry. The year-round park features 40 total pull through and back in sites, a dog park, after-hours self-check-in area, and an on-site manager. Online reservations available, www.newberryrv.com. 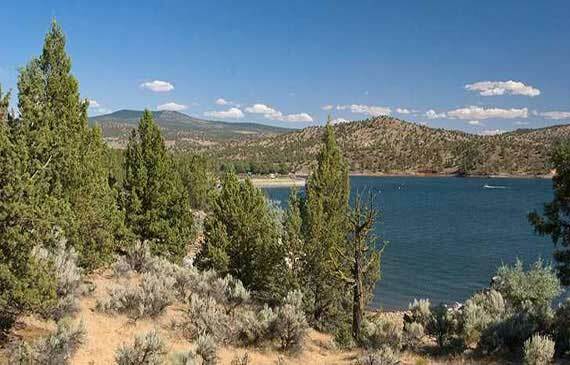 Scenic beauty, camping and water recreation at its finest in the High Desert when you stay at the Prineville Reservoir State Park. Mountain waters flowing out of the Ochoco Mountain Range join to form the Crooked River. The river, confined by its canyon and the Bowman Dam, forms the 15-mile long, 3,000-acre Prineville Reservoir State Park. With two developed campgrounds and numerous primitive camps along its 43-mile shoreline, recreational opportunities are plentiful. The fishing can be good anytime at Prineville Reservoir State Park. The lake supports rainbow trout, small and largemouth bass, catfish, crappie, and crayfish. The trout fishing experience is year-round, with the biggest fish being caught during the winter months either by boat or from the shore. The bass, catfish and crappie fishing is best between May and October. Other recreational activities include waterskiing, wakeboarding, windsurfing, paddle boarding, kayaking, hiking, star gazing and wildlife viewing. 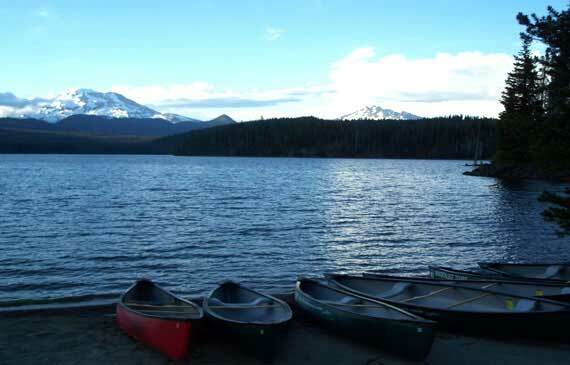 There are numerous year round camping opportunities within the state park on the reservoir. In the developed areas there are deluxe cabins with full amenities, full hook up RV sites and tent sites. Flush toilets and hot showers are also available. For those who like to rough it, there are many primitive drive in and boat in campsites around the reservoir as well. This oasis in the High Desert is waiting for you so come out and enjoy the fun! Two campsites and two cabins are accessible to campers with disabilities. Scandia RV Park offers an oasis in the middle of Bend, Oregon. Plush green grass and trees provide the perfect setting to fire up the Bar-B-Q and relax or tour many area attractions. If you prefer to take the night off from cooking, there are quite a few restaurant choices within just a short walk of the park. We are located in the City of Bend so that you are close to the Old Mill, Old Town, Amphitheatre, the Deschutes River, as well as convenient for doing the Ale Trail. Scandia RV Park is family owned, and we welcome you as “family” for just a one night stay or to stay longer. Deanna and Richard, our on-site managers, provide the personal touch to make you feel welcome from the dog treats, Deanna’s candy dish, and Richard’s fresh morning coffee. We look forward to making your stay enjoyable. We are full almost every night in June, July, August, and early September. Please call ahead for reservations at our office 541-382-6206 to enjoy one of our large sites including many pull-thrus. Our sites include full hook-ups with cable TV and WIFI at your site. Come join the “Scandia Family” in Bend, Oregon. Creekside Campground is a municipal park which offers a total of 67 campsites including 25 full hook-up sites plus a separate “hiker/biker” area. Each site is equipped with a fire pit and a picnic table. The campground has restrooms and showers as well as an automated sewer discharge site. It is situated along Whychus Creek and within walking distance of downtown. A covered footbridge spans the creek and leads to Creekside Park. The campground is open from April to November during which time a camp host is on site. For more information, please call City Hall at (541) 549-6022. Creekside Campground is located on the southeast side of town, adjacent to Whychus Creek. A footbridge spans across the creek and connects the park to Creekside Campground where the restrooms are located. This park offers picnic tables, a drinking fountain, nice lawn areas and shade trees. This park is available for public events. Please call (541) 323-5220 for more information. For reservations, please call Julie at the new campground reservation line, at (541) 323-5218. Quiet hours are between 10 PM and 6 AM. Only small fires are allowed in fire pits. Put out all fires when not attended. Maximum stay is 14 days in any 60 day period. For Hiker/Biker sites, the maximum stay is 2 nights. Nestled in the heart of sunny central Oregon, Tumalo State Park Bend, Oregon rests along Oregon’s spectacular Deschutes River. The campground is simultaneously close enough to the town of Bend to make an quick jaunt to the grocery store, but far enough away to escape the commotion. The location of Tumalo State Park makes it an ideal stepping stone for any type of outdoor activity you could possibly dream of: lush green golf courses, clear blue-ribbon trout steams, pristine alpine lakes, miles upon miles of challenging yet scenic hiking and mountain bike trails, and of course the Cascade Mountains are all within easy reach. At dawn or dusk try casting for rainbow trout as they sip at mayflies and caddisflies. Grab your raft and float with your feet dangling into the cool water during the heat of the summer. Take a hike and explore one of the river trails as they gently wind through canyons created by the untamed river.